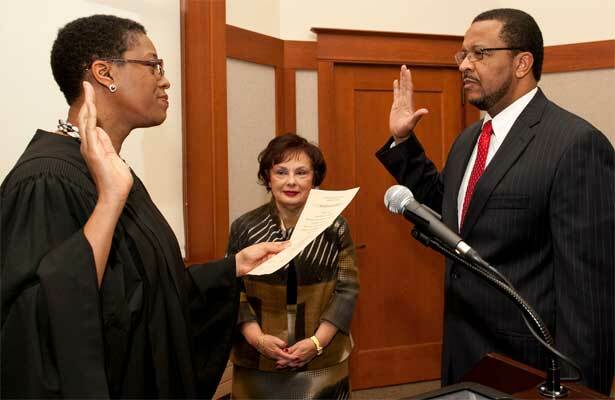 The swearing in of Northern Illinois University’s newest trustee, Wheeler G. Coleman, ended in unusual fashion Thursday. It was sealed with a kiss. Perhaps it wasn’t all that unusual, considering that the person administering the oath of office was his wife, the Hon. 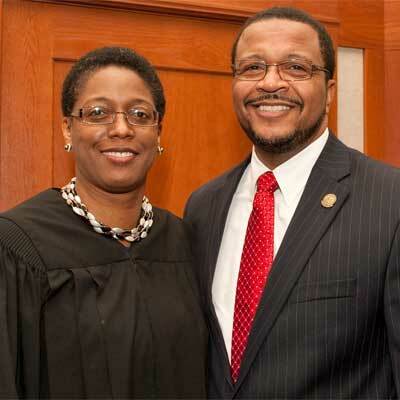 Sharon Johnson Coleman, a federal judge serving the Northern District of Illinois. Fittingly, she recalled, that peck came almost 32 years to the day (well, 32 years and two days, for those keeping score) since the couple shared their first kiss, at the McDonald’s on West Lincoln Highway in DeKalb. “We were a really low key couple. Most of our dates were in the library,” she said with a laugh, recalling that the romance blossomed from a friendship that began in a class back when she was studying for a degree in history and he was looking to earn a degree in computer science. She graduated in 1981, he in 1983. “Not only was he this cute, tall, young man with a great voice and a great smile, he was also the most determined and focused person that I had ever met, and have ever met,” she told the board of trustees, prior to administering the oath. The two have come a long way since dates meant textbooks and hamburgers. While Sharon serves as a federal judge in Chicago, Wheeler is the vice president and chief technology officer for Health Care Service Corporation (formerly known as Blue Cross/Blue Shield Illinois), one of the largest health insurance providers in the country. The two have supported each other every step of the way along the journey. It was a proud moment for them both. Of course, she shares his passion for NIU. The Colemans, who live in Chicago, are parents to a 23-year-old son and a 13-year-old daughter.